After much planning and gnashing of teeth, we reached the first day of the new school year. Gosh, I didn't know if we were going to make it, or if I was going to have to make up something to call school before I was done planning. The kids just needed something to do besides screens! The plan today was primarily emptying out the notebooks of last years papers, getting them set up for the new year, and explaining how each subject was going to work this year. Normally, I'd have the notebooks cleared out and my work samples filed into our records already. However, I totally dropped the ball last year, and we ended up with a disaster of a year. I dropped anything that looked like English. We read books and talked about them, but I had nothing to show for it. Then we got so far behind that it took up to this past Friday to finish math. And we didn't even finish state history yet. We are NOT year round home schoolers. Getting any of us to do anything that looks like school work during the summer is nearly impossible. I finally had to accept that getting math done so we can move onto high school with a clean slate would be good enough. None of us want to do that again, so everyone is motivated to get down to business, and neither of the big kids want to take days off and get behind again. Once we got the notebooks emptied, we set them up for the new courses. This was the easy part; all we had to do was put in new dividers and label the tabs. This year will be very different from previous years, primarily because Mikaela and Samuel both start high school level classes. I feel that I need to be more organized and on top of things to be able to do high school well. I too readily drop things in favor of doing something fun, especially if I'm not well-prepared. We just wouldn't be able to get a full credit's worth of work done in a year. And I'd have very poor records to show for it. And I would have very inconsistent grading methods. So, to fix all of that, I decided to write a syllabus for each of their classes...and I even got most of them written in time. Why a syllabus? Well, because I had read that some other moms actually do this. And it will acquaint the kids with syllabi. And it will be a written record of how the class will work, what kinds of assignments there will be, how their grade will be formulated, etc. They won't be able to argue about what is expected. I won't forget how I intended to grade. There will be consistency. Yeah! 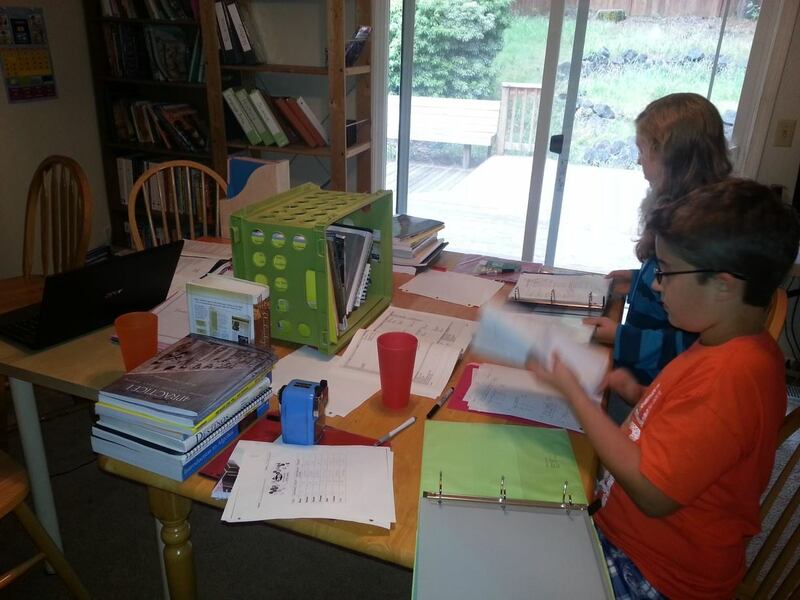 So, we spent today emptying binders, adding dividers, and reading through syllabi. As we discussed each class, I was able to pull out the books they would need, show them how the curricula were organized, let them know that they weren't getting away with giving me bare minimum this year. Yes, you have to participate in Spanish because you can't learn it without actually speaking it...out loud. And to make sure you participate, I'll be grading you on participation daily, and it will be part of your final grade. Yes, you actually have to keep your papers in your notebook rather than lying around all over the house in random locations. Yes, you will be graded on having an orderly and complete notebook. Yes, you have to write lab reports and here's how they will be graded. Basically, there's a lot of bad habits that need to go away, preferably before they move onto college. And it's all my fault because I've been way too inconsistent. Not this year. We also have a new set up in our school room. We put two tables that we happen to have together to form one larger table. The big kids sit facing the white board since they'll need to see it more. We put books that they share in the tipped over crate and their individual books in the corner on their side. They like having them all within arms reach without having to get up and hunting for them in the bookshelf. On the smaller table, with their back to the white board, the littles will do their work. In the photo, their table is cluttered with my stuff because I didn't have them doing much today. Overall, the day went well....and very long...thanks to a Maddie meltdown (they are legionary around here) and a surprise visit from the property management's handy man. But the kids didn't complain, and we'll all set to get down to business tomorrow. How did you first day of school go? Thank you very much. I'm really impressed with this article, it is very professional. custom essay writing service I think you have to learn about this issue is very carefully and have good knowledge.